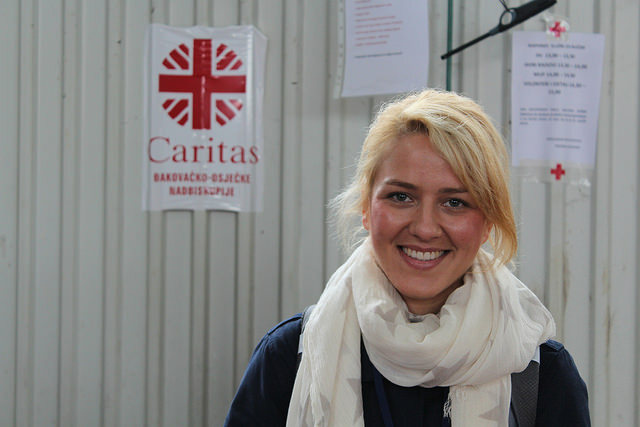 Caritas Croatia has a large operation in Opatovac, with 56 volunteers working day and night to provide food and clothes. The organisation has also supplied 200 bunk beds for weary refugees. People can sleep there, have showers, eat something basic and get a change of clothes before hitting the road once more. Bibihal Uzbeki, aged 105, from Kunduz in Afghanistan, rests in the medical tent in Opatovac. She’s travelled thousands of miles to get here. Wrapped in a green shawl, she looks tiny and tired. Today, after travelling for twenty days to get to Croatia, she went from being an unknown great grandmother to the oldest and probably the most famous refugee in the world. Her small black shoes sit at the bottom of the bed. She must have felt unimaginable relief on taking them off after her long journey. When asked if she would like a glass of water she said: “I have everything my heart desires.” She’s made it to Europe with her family. Earlier that day, Bibihal would have crossed the busy Berkasavo border crossing, a no man’s land between Sid in Serbia and Croatia. Refugees like Bibhal arrive at this crossing in masses, children carried by parents, elderly and disabled in wheelchairs, the young and old, small families and large groups. It’s a sea of thousands of people, all E.U. bound, abandoning their homelands will their belongings on their backs. They’ve been wearing the same clothes for days, have had little sleep and have not been able to wash since leaving. Every day, up to 6,000 people pass through Opatovac, which was once an oil storage facility. In sad scenes reminiscent of people fleeing World War Two, long lines of families arrive with their bags, dazed children clutch their parent’s hands, dropping their toys in the mud and people wrap themselves in grey blankets to get warm. There are rows and rows of green military tents, alongside army, police, the cold and the fog. Caritas Croatia makes 4,000 litres of tea a day to keep the refugees warm. As temperatures start to drop, the plight of refugees facing the biting European winter is a huge concern. Simple provisions like hot tea will be even more vital. “We are scared that people will die in the cold if they have no jackets,” says Margareta.